The Texas Urban Sawmill is pioneering tree reclamation efforts across the state of Texas. Our stakeholders are single family homeowners, ranch owners, commercial property owners, architectural firms and construction firms. We typically focus our salvaging sites within 150 miles of Dripping Springs, TX which allows us to cover all of central Texas. We also support turn-key urban wood utilization projects in San Antonio, Austin, Houston, Dallas and Ft. Worth. The shear size of this tree is quite amazing. 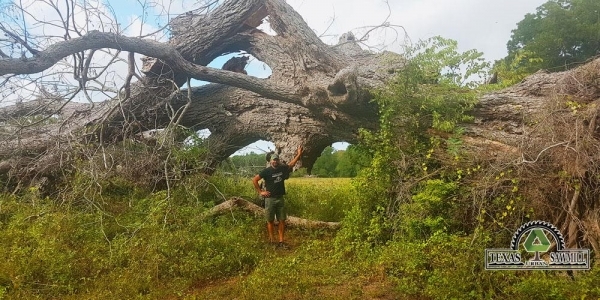 We were honored when a resident in Luling, TX reached out to us after a series of severe storms had blown over several 100+ year old pecan trees. After speaking with the ranch owner, we took a trip to survey the reclamation site. Upon arrival, our jaws dropped when we witnessed the largest pecan tree that we’ve physically seen anywhere in the United States (living or dead). It rivals the oldest living pecan trees registered in Texas and with the Big Tree Registry by Texas A&M Forestry Service (Gig’em). It is truly a monster pecan which is estimated to be ~300 years old. This tree will be the largest and oldest documented salvaged pecan in the United States which we will re-purpose into historical Texas lumber and furniture. It will also be the one of the most challenging tree salvage projects that we’ve had to tackle to date. Heck, we are not exactly sure how much of this tree that can be re-purposed as the lower end is fairly decayed but that’s not the point. It has historical significant which likely dates back to the first Spanish civilian settlement in Texas occurring in 1718. Please stay tuned for additional re-use blogs highlighting this tree and effort. It also will become part of a future news story on us published by the Texas Country Reporter. We will be removing the tree by November of 2018 and are in the process of coordinating all the heavy equipment required to save such a massive and extremely heavy tree. This is truly a piece of Texas history which we hope to re-purpose for others to share, touch and feel.